We have officially reached the one month mark in this house with two littles and it has been nothing short of interesting. 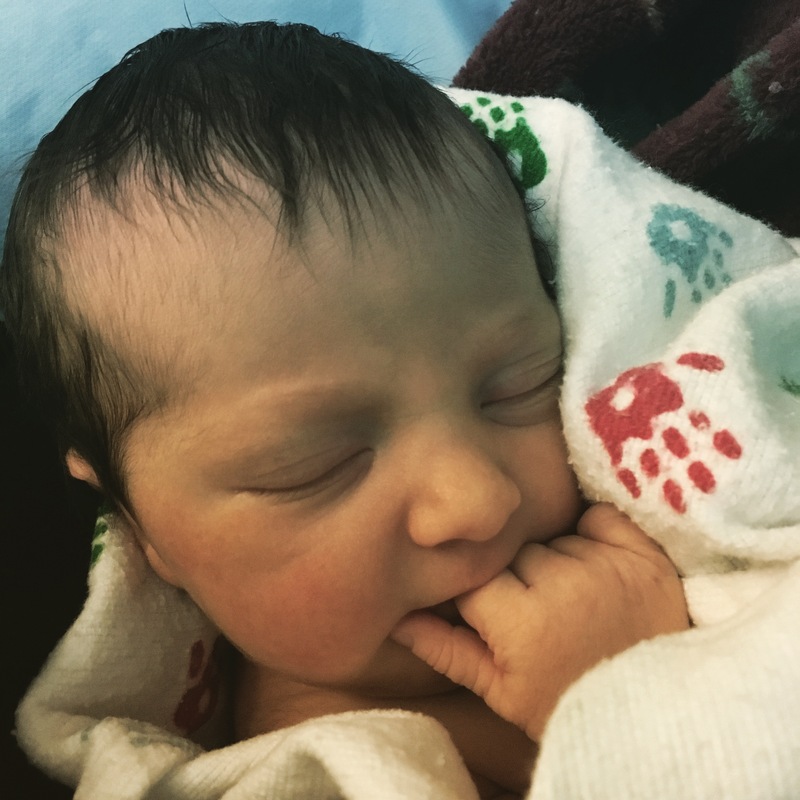 After what seemed like a ridiculously long pregnancy and a million false alarms, we welcomed baby Maeve into our family on Friday morning August 4th. I am a little bias, but isn’t she gorgeous?! I was positive I had to be hallucinating when I saw that hair. I will be honest, I did not have a hard time transitioning into parenthood with our first babe. Sure, I had the typical first time worry and nervousness, but overall I felt so confident and happy those first few weeks. Going from 1 to 2 children has been a different story. Shain did not have much time at home this go around and he had to leave for a work trip when Maeve was just a week old. 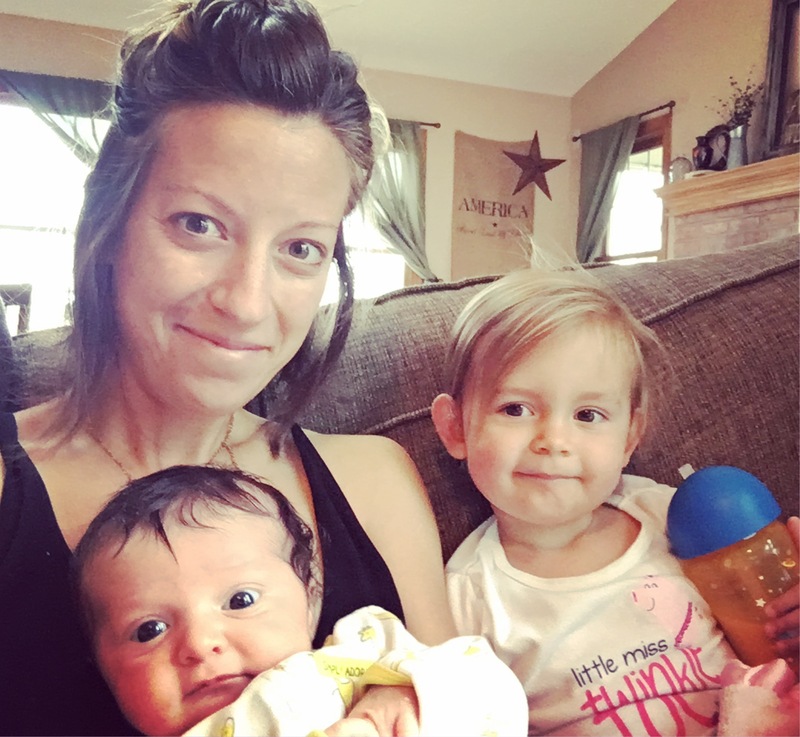 This left me feeling really overwhelmed and pretty isolated as I tried to figure out how to manage a suddenly emotional toddler and a newborn on my own…not to mention I did not feel emotionally stable either. I actually think my 1.5 year old and I were on the same emotional plane for a bit, you know the one where you are crying about absolutely nothing? Yeah, that one. I do want to share a few moments from the first two weeks, just because it was so ridiculous/hilarious/stressful/awesome. Shain brought big sister Rocklyn to the hospital to meet Maeve. She immediately wanted to touch her nose, eyes, talk to her, even gave her a kiss on the forehead unprompted. 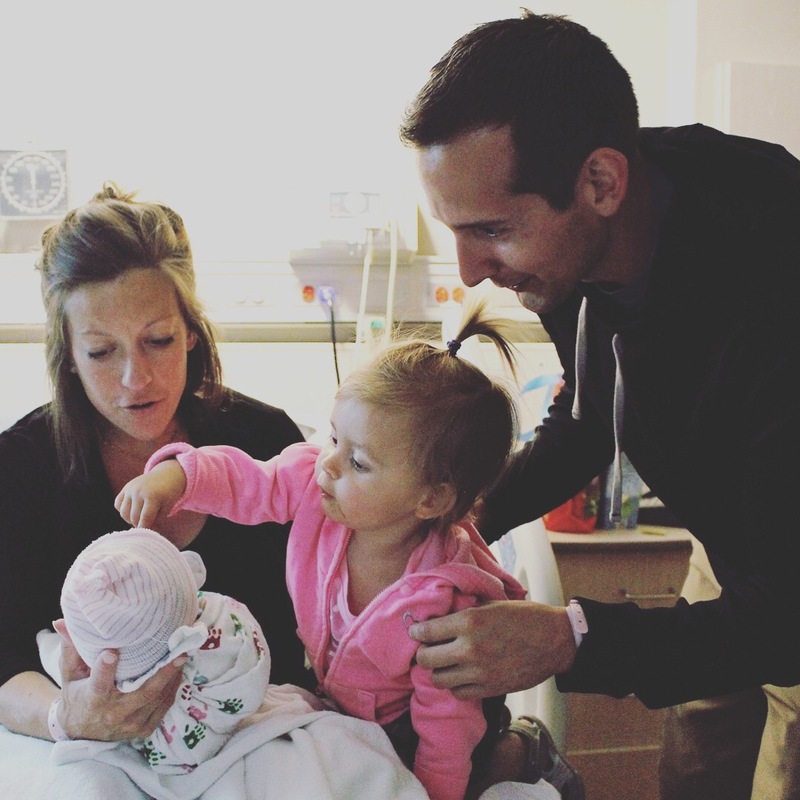 However, that sweet moment quickly vanished as she then became very emotional, throwing a tantrum in the hospital room and wanted to leave, repeating “no like it, no like it!”. Our family laughed that she was referring to her new sister, but I think she was just a little overwhelmed by the environment of the hospital. Even though it was a funny moment, part of me felt really heartbroken that Rocklyn might have some trouble adjusting to this change. Insert mom guilt. People warned me about that. We got to go home, hooray! 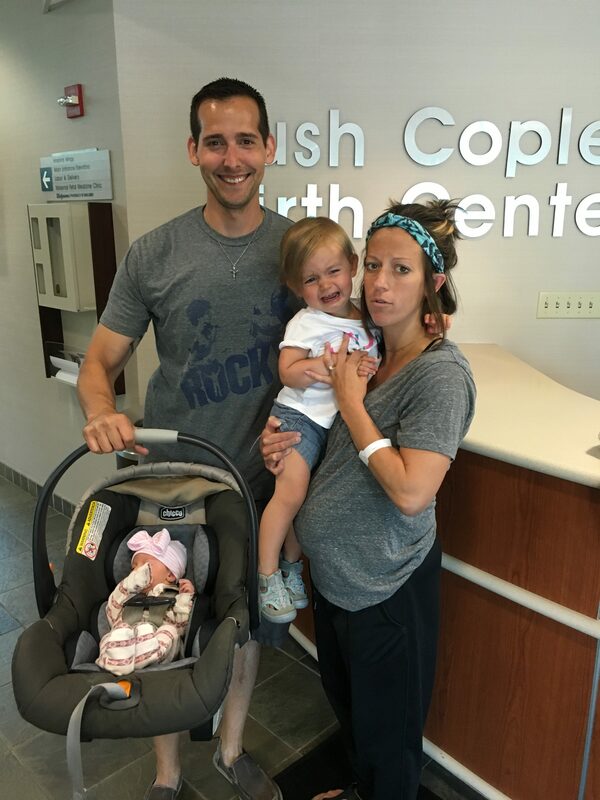 Here is our less than perfect (yet perfect) family of four picture leaving the hospital with yet again, the emotional roller coaster that is a 1.5 year old. In this particular picture, she was upset that she could not run up and down the halls. Typical. On the drive home, Rocklyn kept talking to Maeve and looking at her saying, “Hi baby, your’e OK. What doing?” Ahh, there is my sweet girl. She will come and go a bit as it turns out the next few weeks…and maybe until she is in college. Up until this day, Maeve had not made much of a peep or cry so we were all like, “sweet, another chill baby! Lucky us!”. Then I took her to her follow up doctor appointment and she WAILED the whole drive there, apparently both my kids hate the car, thumbs up. I am certain this is also the day she learned what crying was, and let’s just say has put it to very good practice since. This girl can really belt it out, let me tell you. There are times I am certain she is damaging her vocal cords. Shain went back to work and all the emotions set in. Can I handle two kiddos? Of course I can. My body was not feeling very recovered yet, so chasing around Rocklyn was not the easiest. I was feeling really sad/overwhelmed/anxious about him going back to work already and even more so anticipating him leaving for his work trip that next week. What did not help was that this particular day, every time I nursed, Rocklyn would have a meltdown. Which was a lot, because Maeve was nursing constantly at this point. One moment, she even cried so hard she made herself puke, which was a first. So that was awesome. That has since gotten better, thankfully. 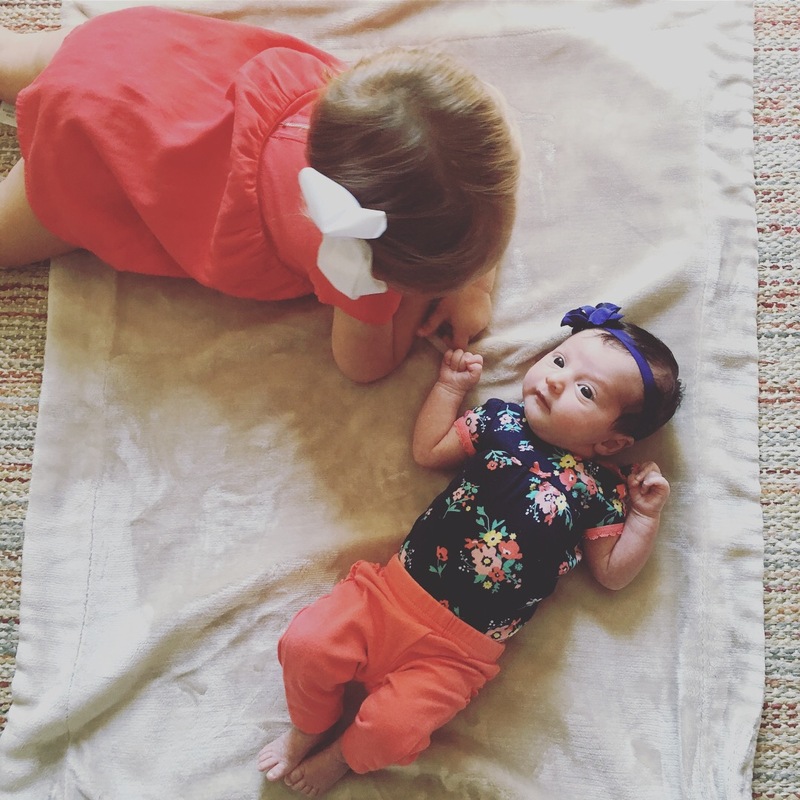 Otherwise Rocklyn is very much obsessed with Maeve and loves to constantly be around her…and also loves to wake her up from her slumber by shouting, “HI BABY!!!! !”, inches away from her face. Sigh. My mom came over to help, thank GOD. I took Rocklyn to the park that morning for an hour, just her and I. This seemed to help her mood be a little more stable the rest of the day, so I made a note that I need to be sure to do that more often to fill up her emotional bucket. Things were going smoothly until one moment I was tending to Maeve and Rocklyn managed to have her first ever pooplosion that required a mop to clean up off the floor, an immediate bath, and a disposal of the clothes she was wearing. Another first, awesome. Shain left for his work trip. Here we go. I cried a lot and felt way too sorry for myself. I also realized at about 9pm once I made it through bath/bedtime/newborn witching hour on my own (which of course all happen at the same time you know) that all I had to eat that day was a half eaten chicken nugget, coffee, and a granola bar. Yikes. 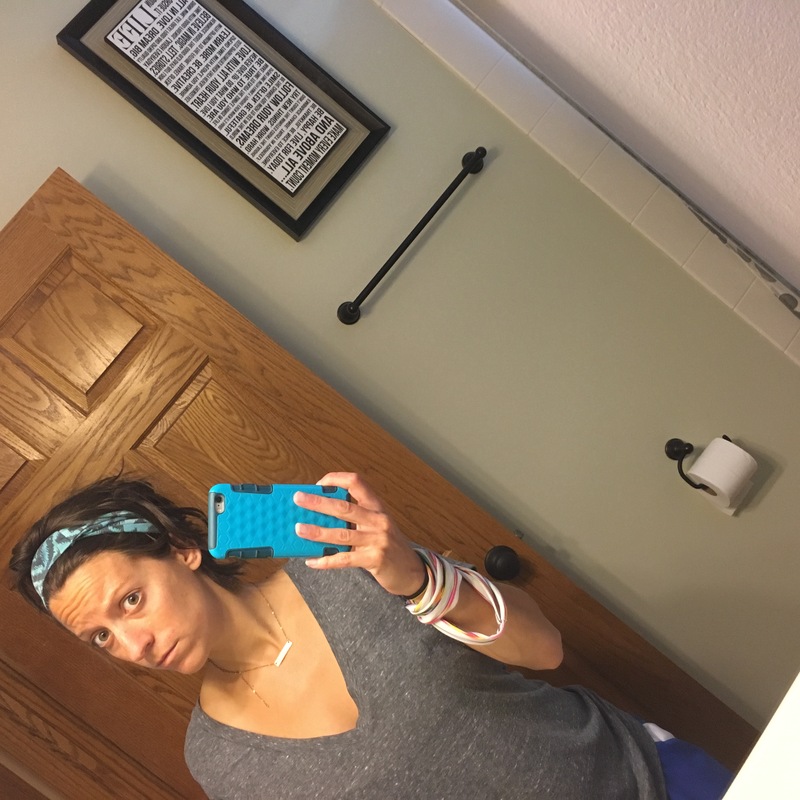 I caught a glimpse of myself in the mirror this day and could not help but laugh. I also realized in this moment I had not actually LOOKED in the mirror at myself for maybe a whole week- WOOF. Hot mess express. I ALSO accidentally put body wash in my hair instead of shampoo for the THIRD time. Officially losing it. But hey at least I have been getting in the shower! Maeve loves the sound of running water it turns out, which is good motivation to put her in her bouncy chair in the bathroom while I spend a few minutes feeling like a real human.